Growing up attending an Episcopal Church (Anglican Church), I remember bits and pieces of the various liturgies, among them both the Nicene Creed and the Apostles’ Creed. Both creeds have been around since the 4th Century. And, no, I wasn’t there when they were first used, though my teenage daughter asked me once if I played with dinosaurs when I was little and didn’t mean toy ones, either. She said she was only kidding. But what exactly is a creed, and why is it important? A creed is a confession, a symbol, or statement of faith. It is something that states or displays the shared beliefs of a particular group of people. Creeds are summaries, expressing only core elements that are essential to a group of people. Creeds are not comprehensive. The Nicene Creed and the Apostles’ Creed are only two such statements of faith, summaries of core beliefs. Some churches use the four spiritual laws as a form of creed. These are often stated as: 1) God loves you and offers a wonderful plan for your life; 2) Man is sinful and separated from God. Therefore, he cannot know and experience God’s love and plan for his life; 3) Jesus Christ is God’s only provision for man’s sin. Through Him you can know and experience God’s love and plan for your life; and 4) We must individually receive Jesus Christ as Savior and Lord. Then we can know and experience God’s love and plan for our lives. The Cross is a form of Creed, too; it is a symbol of both the death of Y’shuaJesus and the life that we are offered through His death and subsequent resurrection. The image at the right is a Celtic Cross, and is seen throughout Wales. 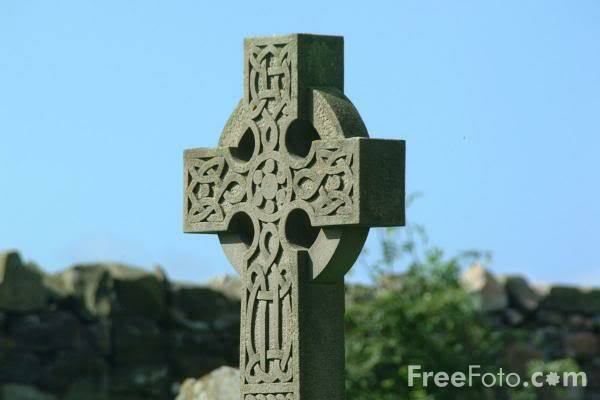 In a cemetery in Wales, a large Celtic Cross stands at the head of my family’s plot, and looks much like that one. I’ve written previously about the giant aluminum crosses along many interstate highways in America. The cross also marks most of the grave markers at the cemetery in Normandy where buried are soldiers who died on the “D-Day” invasion to liberate Europe. Professions of faith, of belief. Since the 4th Century the Nicene Creed has summed up the faith that Christians must have to be considered Christian. The Cross is a visible symbol of that belief. After a time, as I’ve mentioned before in other posts, it is good for us to go back to the place where we began in Y’shuaJesus. We need, on occasion, to take a look at the essentials, the core elements, and see if we can say AMEN! to each and every element. We must not, in our great spiritual holy walk, abandon the core believes, trampling them beneath non-essentials that distract us from the view of Golgotha, the view of Christ died, and the Empty Tomb, Christ Raised, and the sight of Y’shuaJesus ascending into the clouds. Messiah. Lord. Y’shuaJesus. He Died; He Lives. And He will come again. MARANATHA! Come, Lord! AMEN!